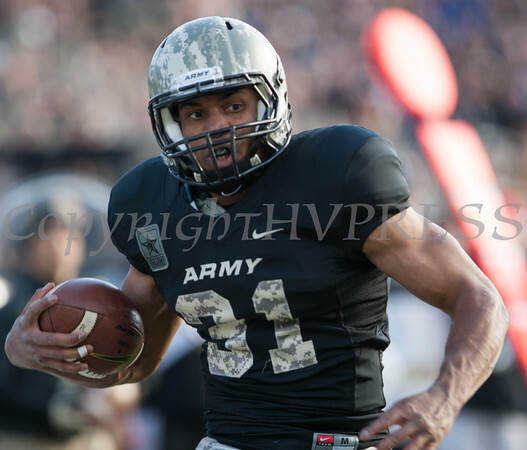 The Army Black Knight's were defeated by the Western Kentucky Hilltoppers 21-17 at Michie Stadiuim at the United States Military Academy in West Point, NY on Saturday, November 9, 2013. Army RB Terry Baggett (31) reached the triple-digit rushing mark for the third time in four games and fifth time in 2013 by totaling 102 yards on 12 carries, to include a touchdown against the Western Kentucky Hilltoppers at Michie Stadiuim at the United States Military Academy in West Point, NY on Saturday, November 9, 2013. Western Kentucky defeated Army 21-17. Hudson Valley Press/CHUCK STEWART, JR.